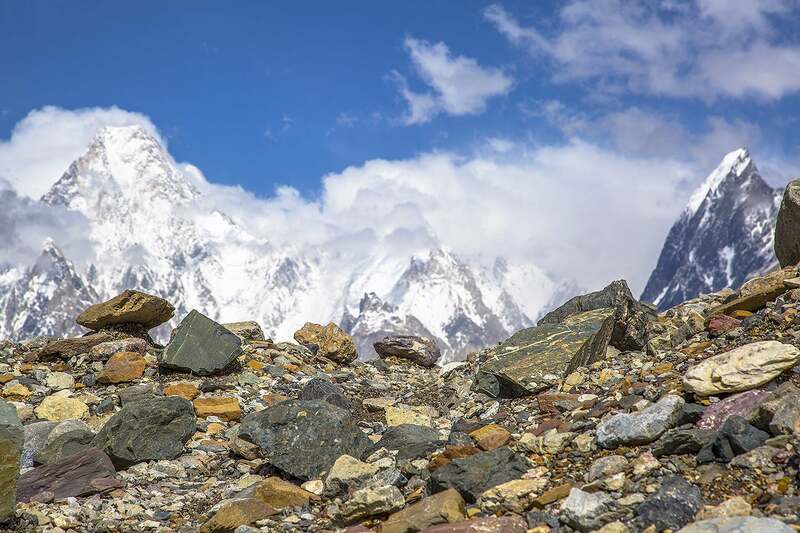 In July 2016, I embarked on an incredibly memorable, yet challenging, 11-day trek to the base camp of K2 — the highest mountain in Pakistan — with three other Dutch hikers in tow. Arranged by Snowland Treks and Tours, our trip started from Islamabad where we stayed for a day. The next morning, we took a short, but a very scenic, flight to Skardu. We acquired a great deal of interesting information about our destination from the plane's captain, which naturally got us pumped for the journey ahead. 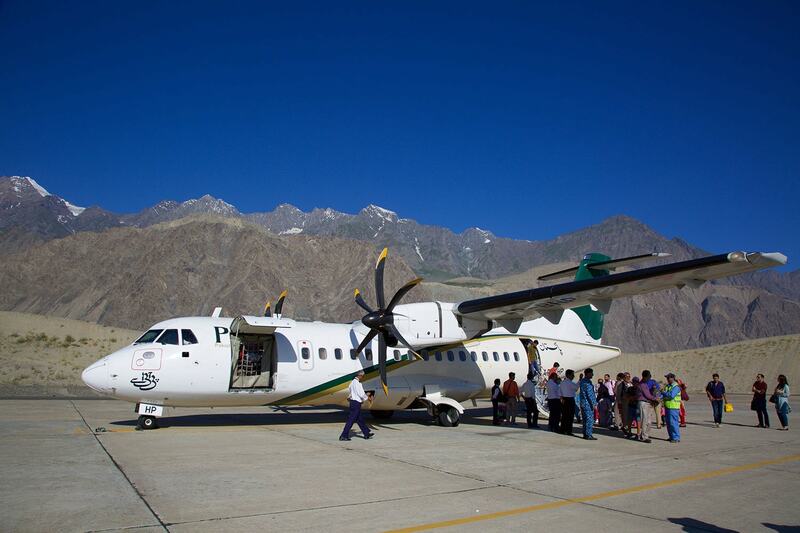 The PK451 flight that took us to Skardu. We passed through Nanga Parbat and Lake Saif-ul-Mulook among other landmark destinations. 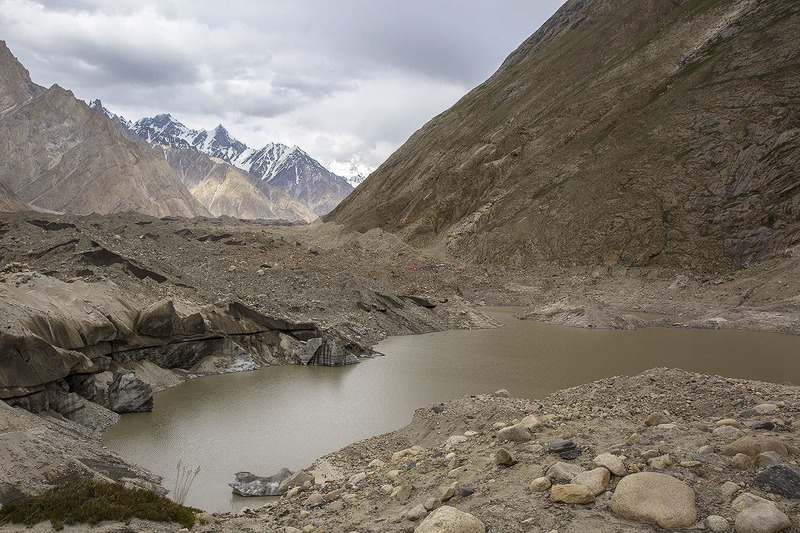 Following a brief stay in Skardu, we left for the town of Askole, which is only 115km away but the rocky roads, not to mention the landslides and floods that we encountered on our way stretched our journey an additional five hours. The picturesque drive through hanging wooden bridges, however, made it worth it. 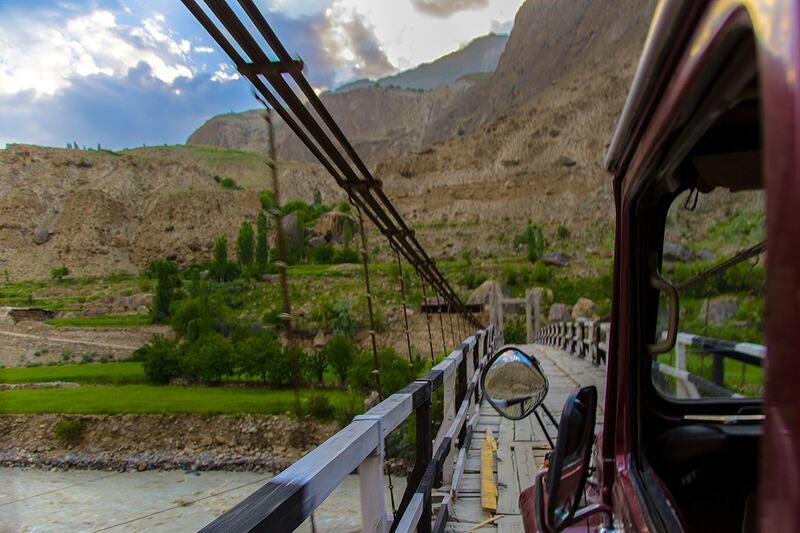 One of the several hanging wooden bridges we encountered on our way to Askole. Arriving in Askole, we stopped for some garam parathas, and washed them down with wonderful milky tea before starting our first trek to the Jhula campsite. We walked through a small lane in the town of Askole that widened as we exited the village. Then, we entered Shigar Valley, where I saw jagged mountain peaks and views that quite literally took my breath away. The track was nice and wide as we left Askole. Much of the track is well-established and follows the Braldu River. Night descending upon our Jhula campsite. Situated at a distance of 18kms from Askole, we reached Jhula just before sunset. We parked our camp next to the river, which afforded us an ethereal view of the Barkhudas mountain peak. The next morning, we trekked from Jhula to Payu campsite, which is 22kms away, at 200 metres of elevation gain; the route that we took was close to the river bank with many uninhabited houses. From a distance, the Payu campsite is the green patch on the mountain. 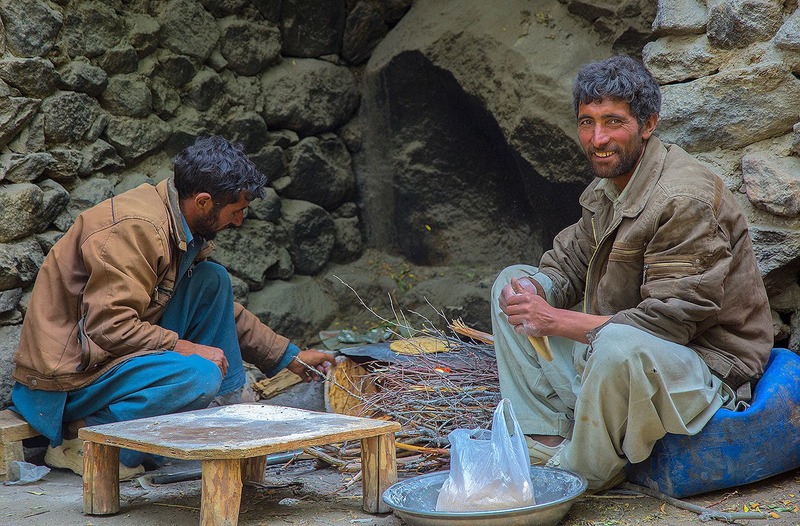 Porters make special bread for us at the Payu camp; they serve pretty good green tea there as well! I woke up in the middle of the night and was awestruck when I looked at the sky. I immediately grabbed my camera to take this shot of the Milky Way from our Payu camp. 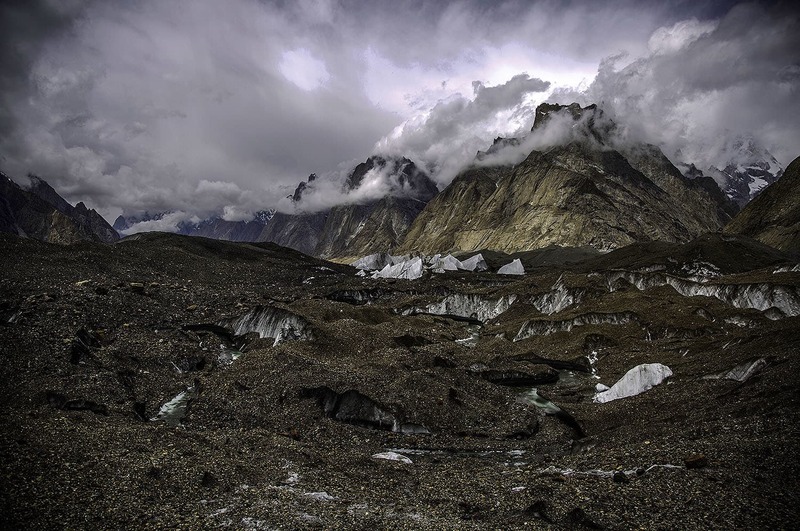 From Payu, we made our way to the Baltoro glacier, the focal point of our trek. The journey to our next campsite Khoburshe was 15km away, with 500 metres elevation gain. 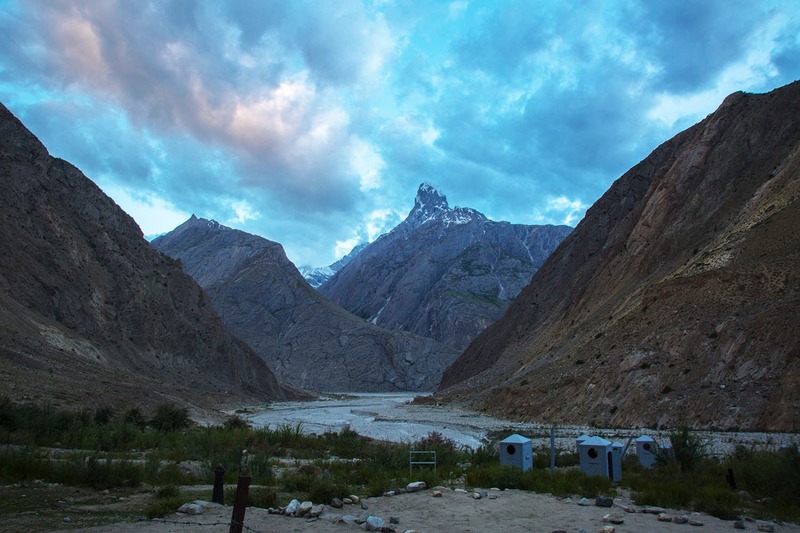 The long distance and the formidable gain of elevation, coupled with our first, tentative steps on a glacier, was taxing but also proved rewarding as we got a glimpse of the spectacular Trango and Lobsang mountain spires as well as the starting point of the serene Baltoro River from here. 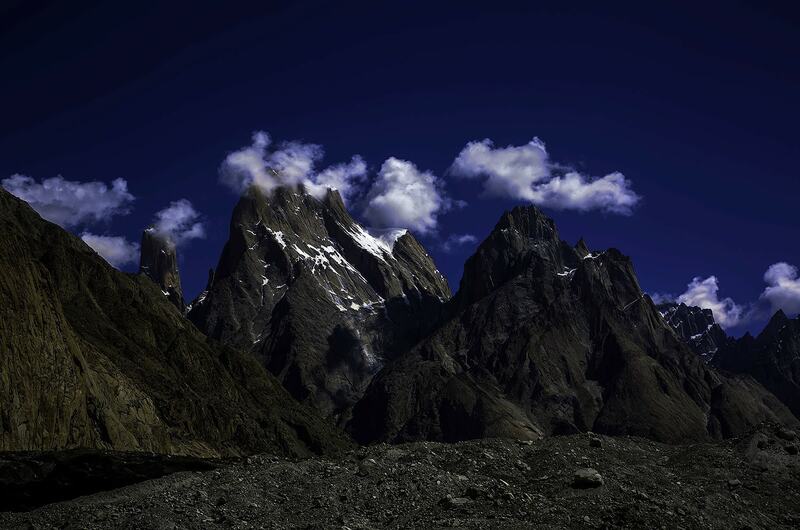 Trango Towers (L) and Lobsang Spire (R). Also visible is the famous Nameless Tower to the left of Trango. Our first view of Khoburshe Camp. We had to take a detour due to the formation of a lake near the camp. 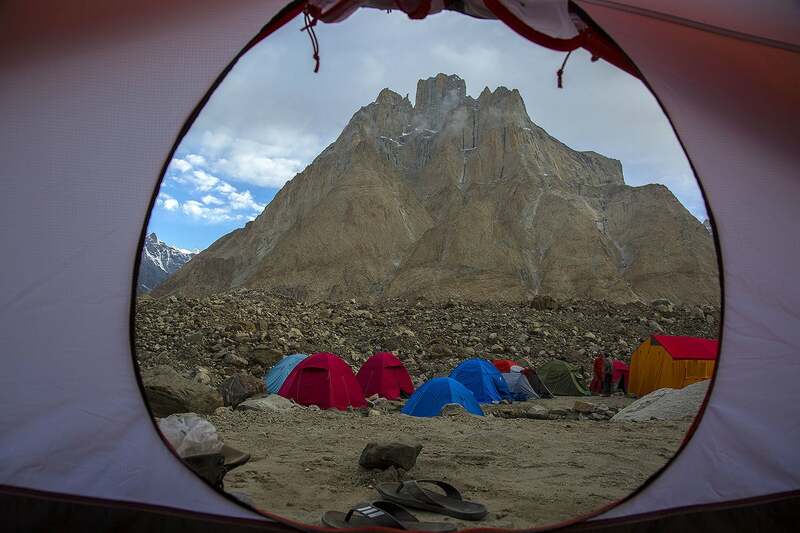 I woke up to a view of the Giant Trango from my tent. Near the Khoburshe campsite, a lake has sprung up due to a glacier melt, which required us to take a detour, adding about another two kilometres to the trek; we retired at the camp for the night. The next morning, we trekked from Khoburshe to Urdukas, which is situated at a relatively short distance of 6km, with 200m of elevation gain. 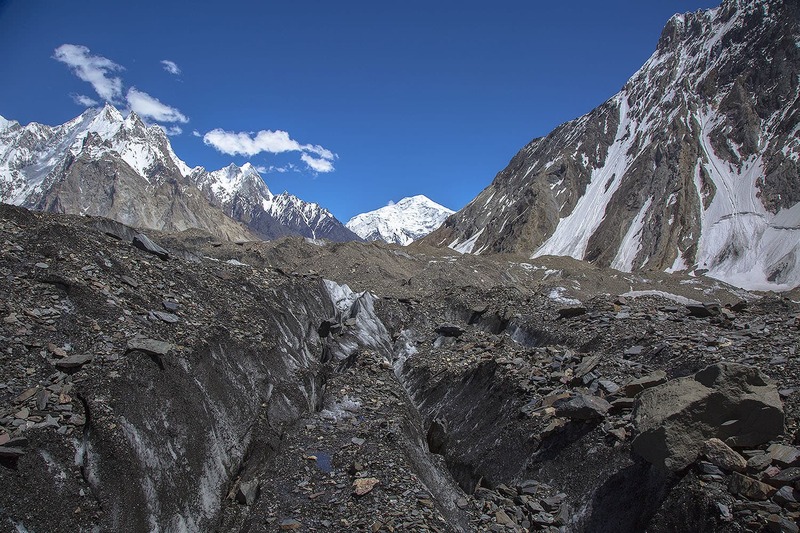 The journey was, by far, the most wonderful part of the trek as we crossed two glaciers and glacial streams to reach Urdukas, surrounded by tall imposing mountains. 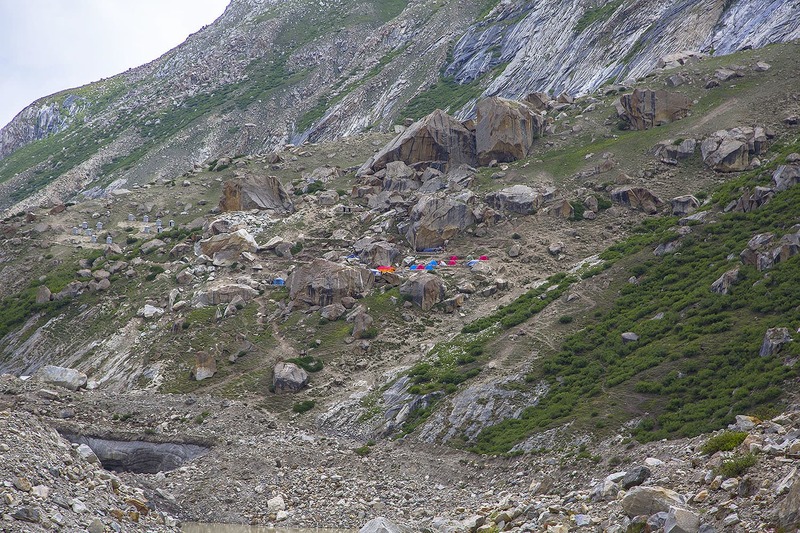 It is a wonderful campsite that sits atop huge rocks. Our first view of Urdukas. Porters singing and clapping as we celebrated Eid. A Pakistan Army officer stationed at Urdukas joined in the celebrations. As we set up our tents and settled into them, we heard the sound of music. 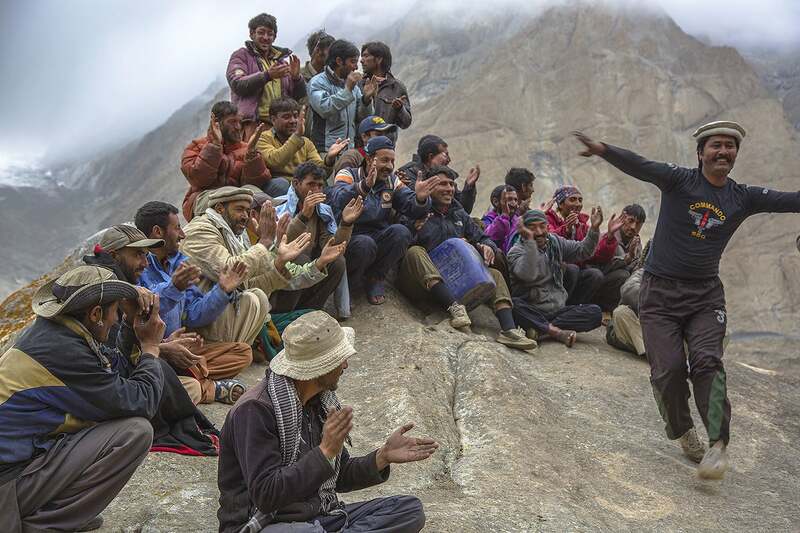 Venturing outside, we saw porters from different teams who had gathered around a big boulder and were dancing and celebrating as it was Eid! Close to Urdukas, there is a Pakistan Army checkpost and some military men also joined in the heartfelt celebrations. Our next stop was the Goro II. It was another long trek of 15kms, with 270 metres of elevation gain. We were ecstatic when we saw our first views of the incredible Masherbrum (7821m) and Gasherbrum-4 (7925m) mountains. The next day, we were back on the glacier, making our way through the crevasses and small lakes. The first rays of the sun on the beautiful Masherbrum mountain. Our first view of Gasherbrum-4 as we climb up the valley. The route from Goro II and Concordia has several snow capsules. Goro II is notorious for being the coldest site. 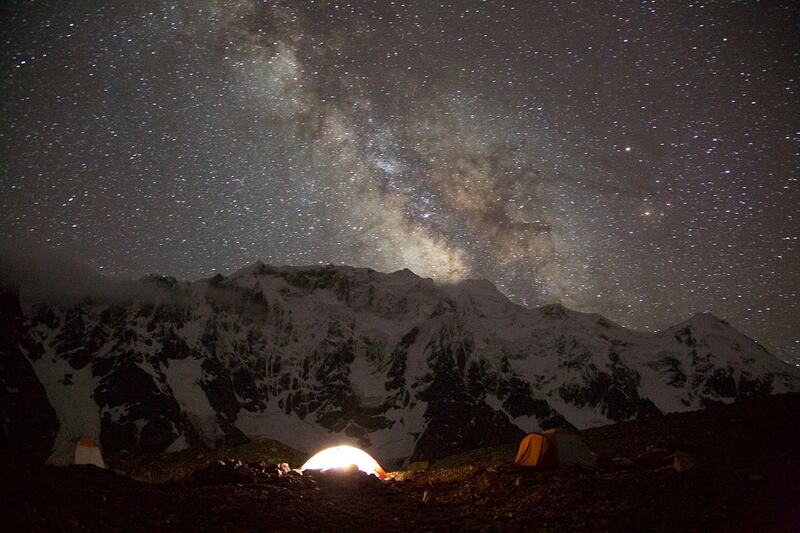 I took this photograph of the Milky Way extending from Biarchedi mountain with my tent lit up. 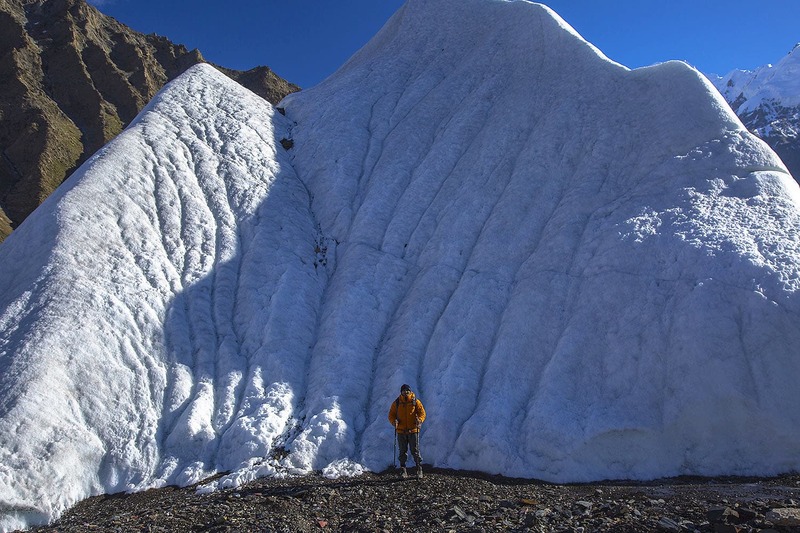 Traversing along the route, we saw large protruding chunks of snow, known as snow capsules. These capsules vary in size and are sparsely found along the trek. Our campsite at Goro II was the coldest on the trek. When I woke up in the middle of the night, my tent was covered in frost. The morning that greeted me was equally cold, if not more. But the day was special. Crossing Gora II, we finally saw the magnificent K2 mountain, and other stunning peaks such as Muztagh Tower (7273 metres) and Mitre Peak (6010m). Our next camp on Concordia glacier was next to Mitre Peak. With that as our reference, we walked about 12kms to reach Concordia. The crevasses just before Concordia. The white mountain in the back is Snow Dome which is about 5,029m high. My first view of K2. Near Concordia, we had to negotiate many complicated crevasses. We also heard loud songs of the glacier cracking up. After what seemed like an eternity, we arrived at our camp on Concordia. 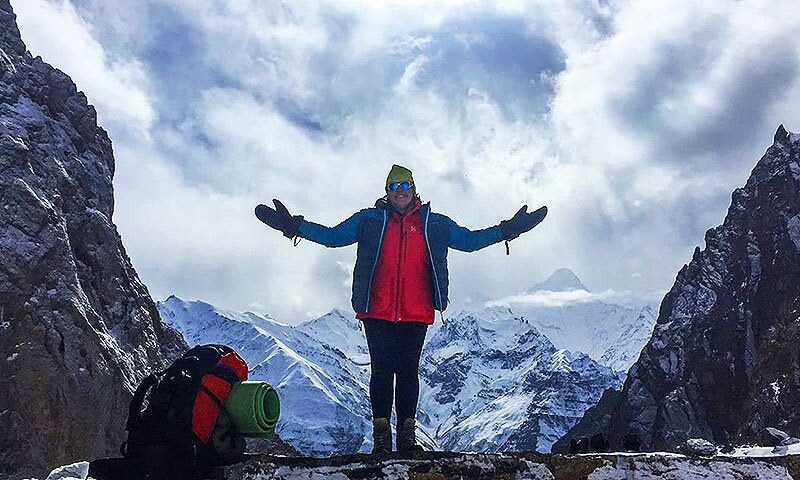 Situated at 4,600 metres of elevation, the high altitude made us easily breathless, even if the movement was something as small as getting up. Most expeditions end on Concordia after which trekkers head back to Askole. 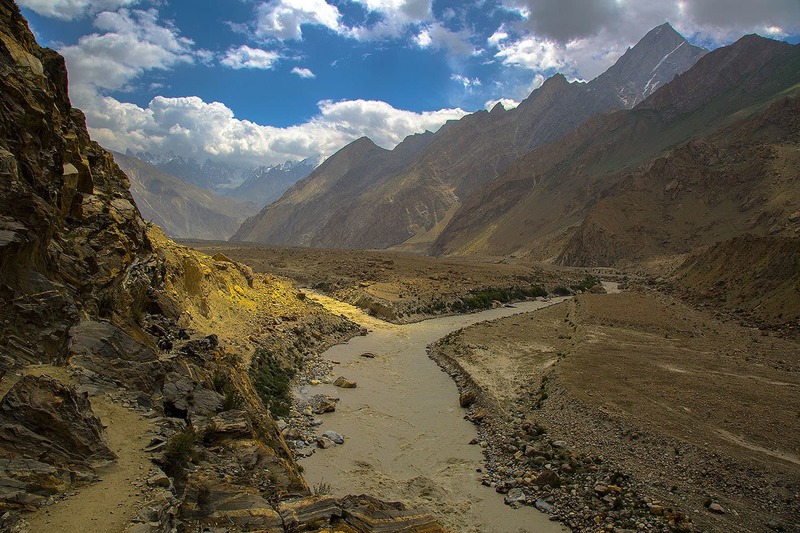 One can also take an alternative route by hiking to Ali Camp and then crossing the Gondogoro Pass to enter Hushe Valley and return from there. It, however, requires expert technical climbing skills. Enroute to the K2 Base Camp. 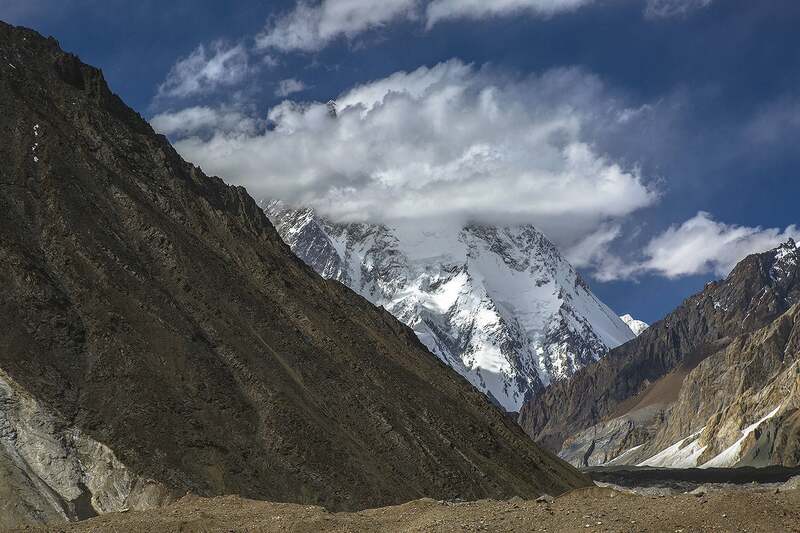 The clouds covered K2 like a halo on an angel. 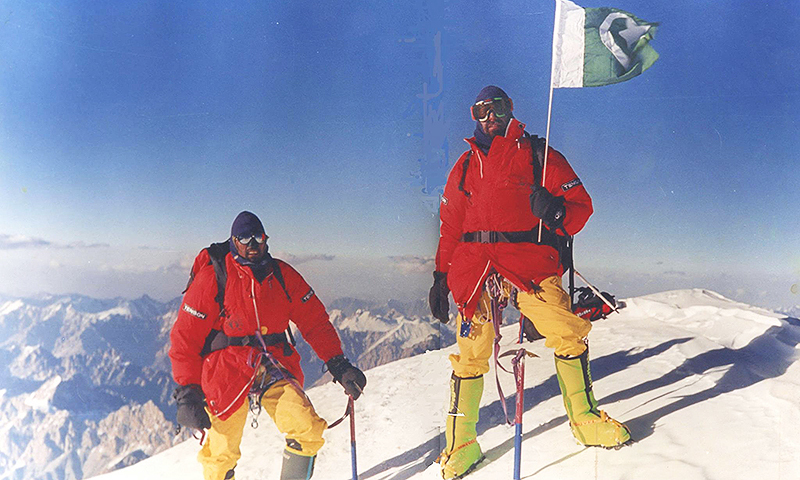 A summit view of K2. 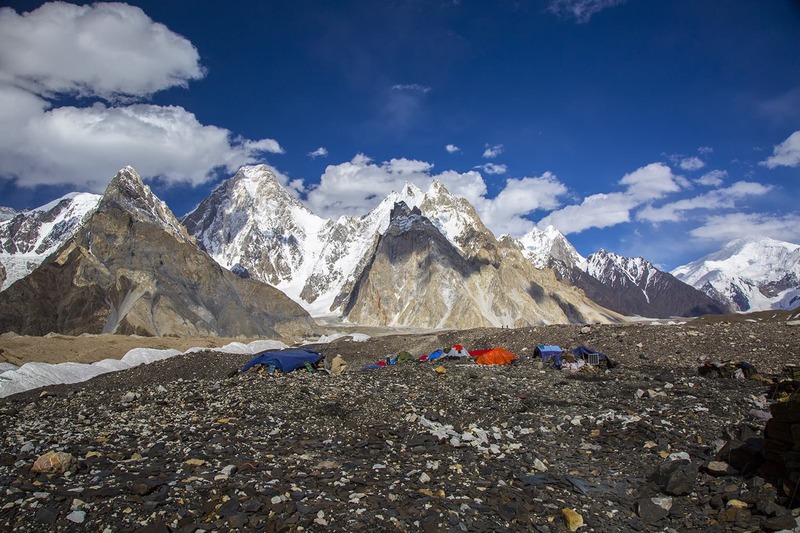 A view of the K2 base camp. In our case, we decided to visit the K2 base camp, which is approximately 11kms away from Concordia, save for one team member who ended up going to the Gilkey Memorial. The three of us, including myself, stayed back at the K2 base camp for about an hour, and had lunch with an international expedition team before returning to Concordia. 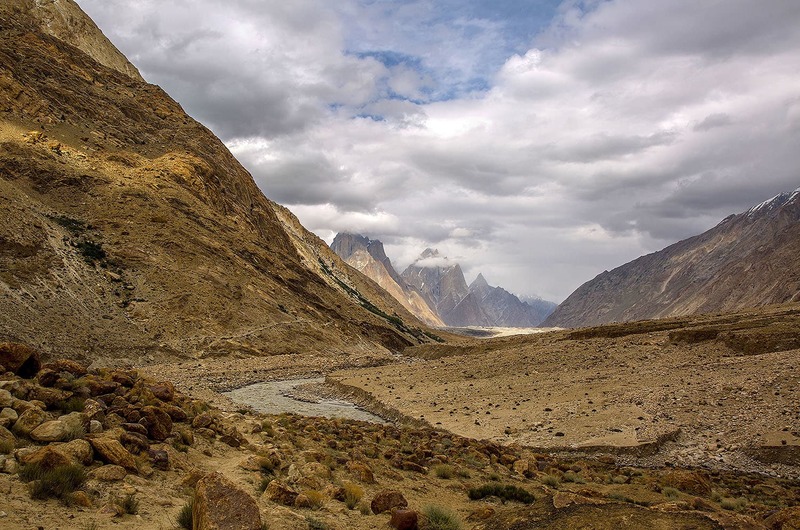 The return journey from Concordia to Askole was 90kms and took us three whole days to return to Askole from where we returned to Skardu the same evening; thus ending our intense, adrenaline-filled trek, one we are bound to remember for the rest of our lives. I need vacation, RIGHT NOW ! thanks for sharing these amazing pictures. wish to go there someday and see all this for myself. That plane ride in PIA must be scary! Did you go through a tour company ? Amazing! Northern areas are the best! Wish to be there, again! Can you share which camera you used? Well-written, well-photographed. 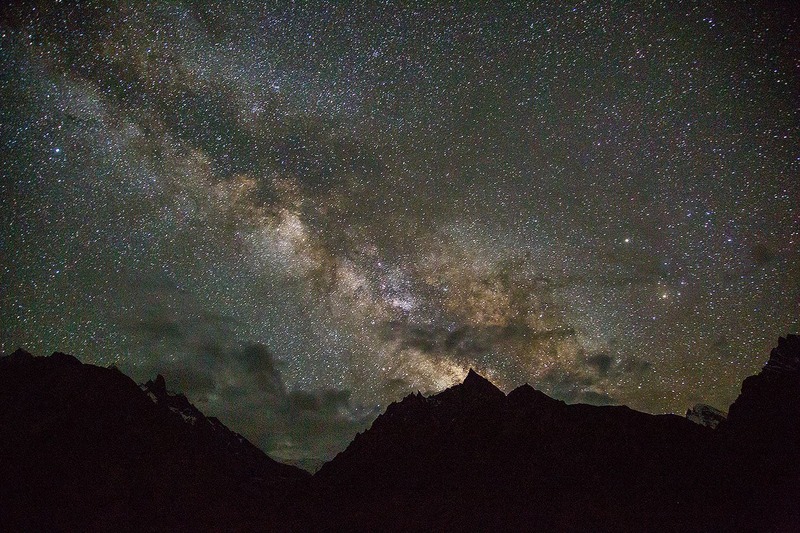 I strongly urge you to enrol the second Milky Way photo in Sony World Photography Contest. Amazing.... Sir kindly tell me whole expenses of your trip??? Lovely pictures and very well written article. You should do trips to other parts of Pakistan and write about them as well. Amazingly brilliant & beautiful pictures of Pakistan...Pakistan never ceases to amaze me. Ammmaaazinggg!!! 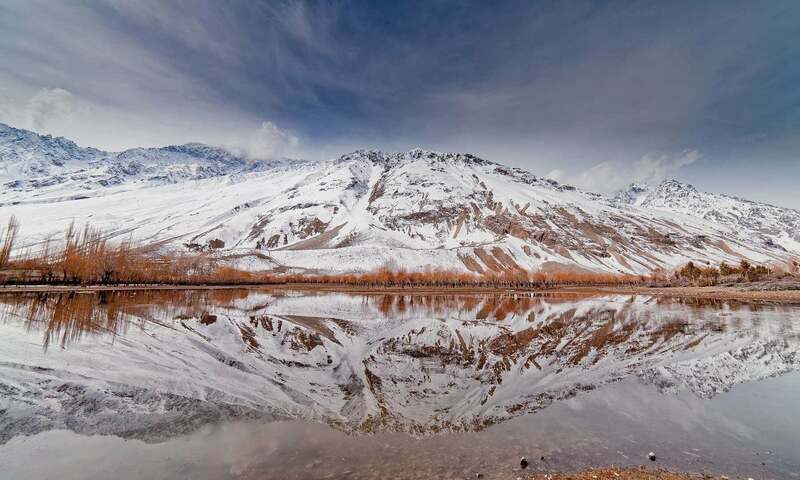 I could travel till skardu and far to another axis. But this journey is awe-inspiring! Loved those mountains looking like the chocolate lava cake with white ice-cream topping! And seeing K2? ahh it is one an only unique experience one can ever have! Imagine Burj ul Khalifa at dubai having merely less than a km height. 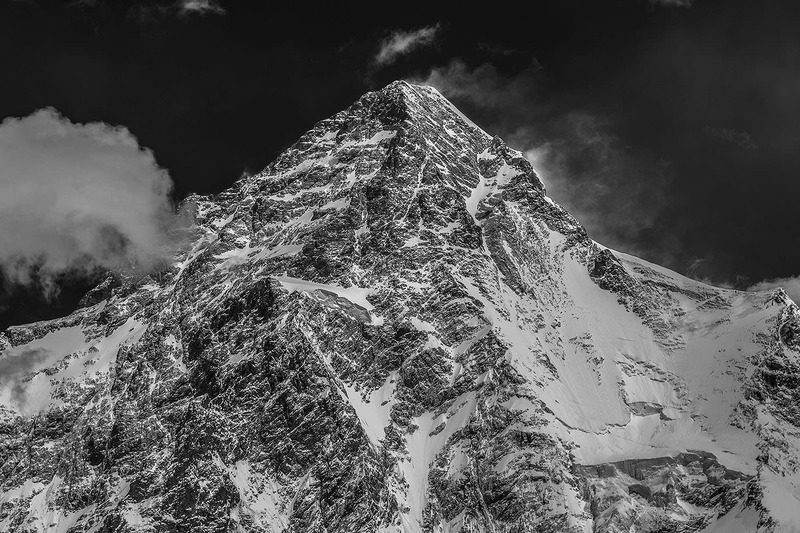 Whilst mighty K2 stands with a sheer face of more than 3 to 4 kms like a powerful king! @jawad Being broke myself, I know how that feels bro! Fantastically articulated both with words and photos!!! Great job Dawn thumbs UP! 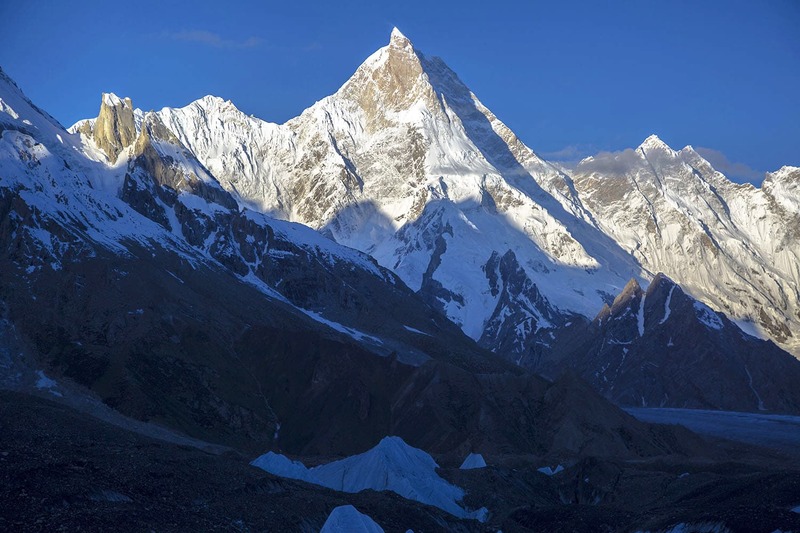 Beautiful, Stunning, Amazing, Majestic K2. Thanks for sharing. goes on my bucket list this. Allah SWT has blessed Pakistan with the natural resources and beauty. 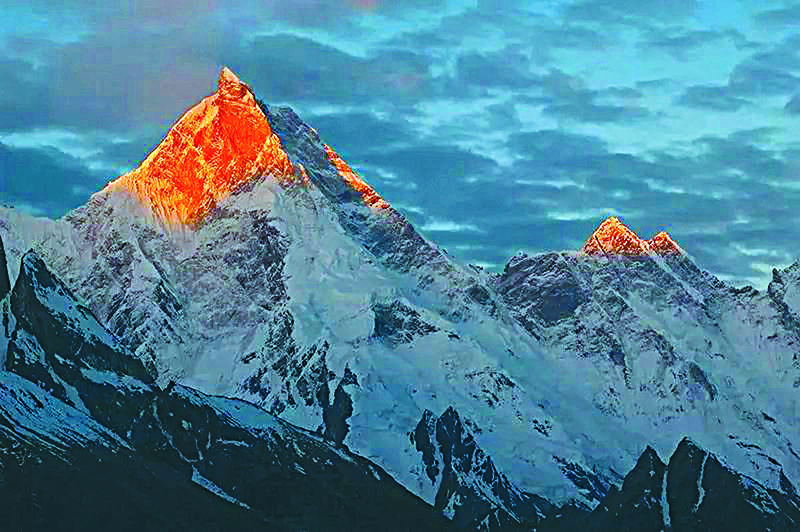 K2 is one of the most beautiful peaks in 8 thousanders and considered to be toughest to conquer. If you passed through Gondogoro LA, you would have seen more beauty. I did it back in 2014. Absolutely beautiful photographs and videos, and great travelogue. Thanks. The Beauty of pakistan . i visited concordia around 45 years ago, it was pristine, landlocked enclave, no passageways, nowhere to stay, just camp out where you can. Years have rolled on, things have changed, looks hundred times organised. 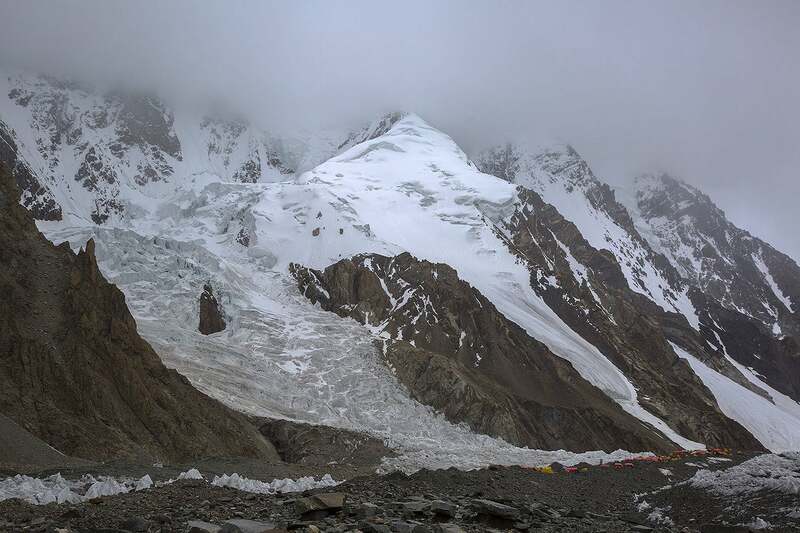 Godwin-austin, gasherbrum complex, masherbrum remain unchanged, although concordia basecamp looks dirty. Trango still stands as it was then. These areas should be STRICTLY RESTRICTED ACCESS areas, away from human activity, otherwise god knows what would local commercial activity do to the land of giants. Leave it, as it was please. We should invite malik riyaz to build here and also build a jangla bus service in the area to facilitate development - at moment the place looks empty and too clean. Wonderful and very informative. I wish I could have the resources to travel to these area and see for myself what I have seen in photographs. 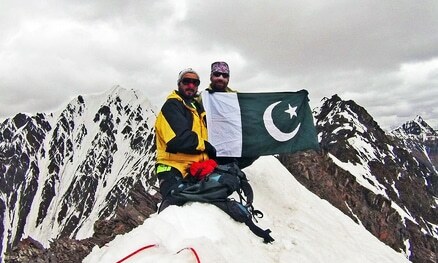 We Pakistanis must be proud of our beautiful country. May God Save our country. With love to Pakistan. Great Journey Imad. I am also planning to be there. Last year when I climbed Kiliminjaro I asked myself, why do people climb these mountains? Why they put themselves in so much pain? Answer is: they don't climb mountains, they climb themselves!! It's always a challenge and a very rewarding one. Happy adventures. Wow ....your pictures virtually took me to this awesome place. Great; Majestic; Thanks for the most beautiful photographs. Grateful for introducing Pakistan and its Giant peaks in very effective way. it's awesome,beautifull,the most beautifull land on earth. Amazing pics. Hats off to photographer. I am not a a very outgoing person but after reading expedition articles like yours, I feel like trying it out. Keep it up and keep going Imad. Breathtaking pics. Hope I ll do this trek one day. Could you please share some details on how to plan this kind of trip and how much money is involved. Thank you. In my college days (mid-90s) we went to murree and one of the hotel agent promissed to give us a room from where we can see K-2.. lol.. we were young but didnt have money so declined.. but that was awesome marketing by that agent.. pl. bear in mind at that time there was no google map etc... back to this article I am amazed by milky ways..just breath taking. Good hike. I have been on a similar one in India, a lot of fun but a lot of walking too. Cheers. Truly amazing pictures and exceptionally well written and informative article. I would love to do this journey with my two sons Inshallah. Let us know how much money required for such trip from Islamabad? how much did this trip cost,I want to make it. Congratulations once again. Loved the high resolution photos and your travelogue. For all those people asking about how much would it cost and how to plan it, read below. Find a tour operator. There are many operating out of Skardu. Our tour was arranged by Snowland Treks and Tours (www.snowland.com.pk). It is mentioned in the second paragraph. Unless you live in Skardu or the nearby areas, the tour will most likely start in Islamabad. 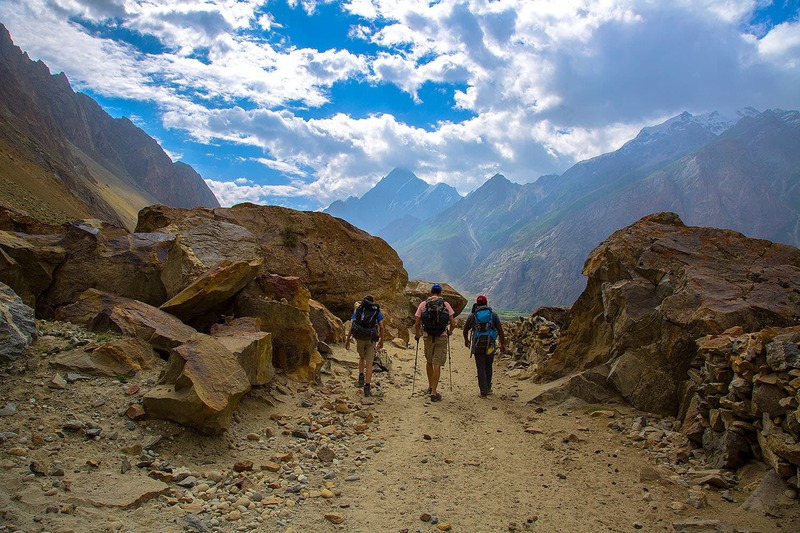 The tour operator will make arrangements for your transport to Skardu and then Askole, from where you will begin the trek. You need to bring good hiking boots, rain jacket, snow jacket, a backpack and all the stuff you need in a duffel bag. You will carry your water and other lighter necessary items in your backpack while all the other stuff goes into your duffel bag which is carried over by mules. The cost varies by operator to operator and will take into account how luxurious you want it to be. Some operators charge from Rs. 110-120,000 and there are some over $2500. Again, talk to the tour operator for the cost. Awesome Pakistan. These mountains embody the spirit of Pakistan and all kashmir. Beautiful, majestic, unyielding, unbreakable, unsuppressable, memorable. 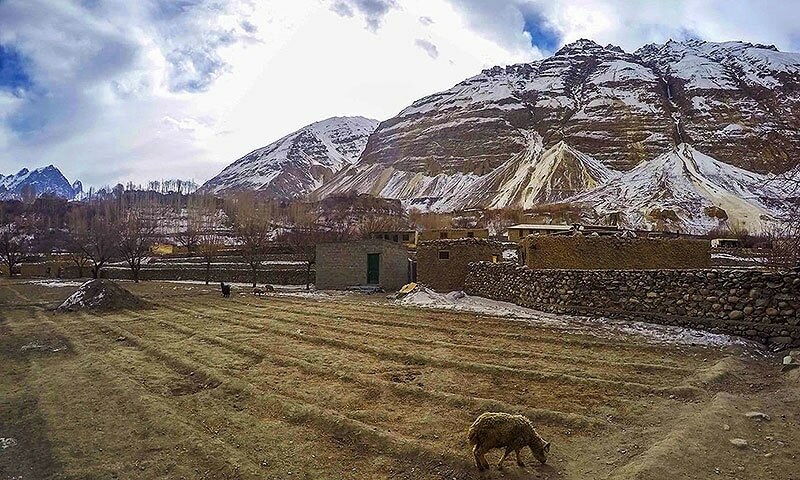 Thanks for sharing photos..wonderful and thanks for telling how beautiful is our Pakistan! Heaven......Will Pakistan grant me the Visa to Trek this beauty.....Ever ? Amzing! Equally enthralling is Ladakh, Nanda Devi trek and Kanchanjengha in India! I myself belong to Gilgit-Baltistan, one of the most beautiful cities of the world. I invite all my national as well as international tourists to come and visit this charming city and see the incredible beauty of the nature. @ARSHAD ALI I second you on the loving nature of the people of GB. The hospitality is wonderful and anyone you talk to is polite and pleasant. @Imad : My pleasure bro. And thank a million to you for showing the true face of Gilgit Baltistan. Thank you Imad for such a well described both verbally and in pictures, story of your travels to the K2 base camp. For those of us who can only dream of such a journey, reading your article has been a delight! Thank you again!!! @Imad please let us know which DSLR did u use? 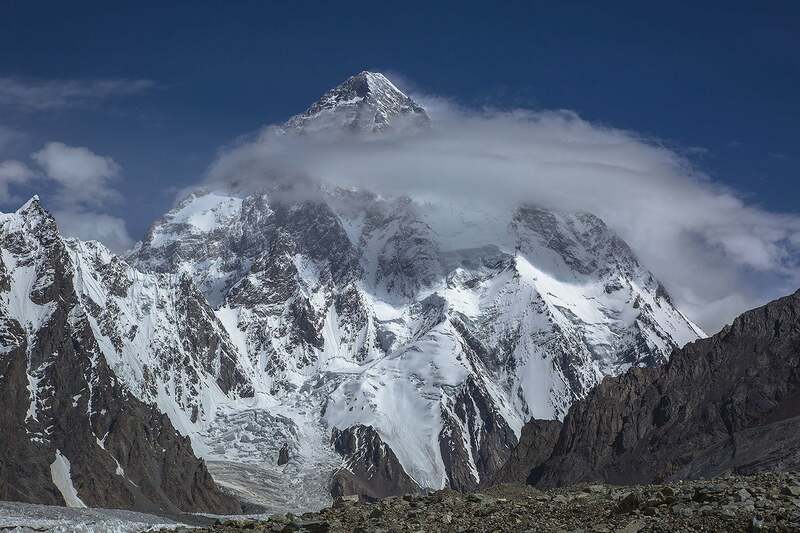 I have seen this mountain K2 in my dreams and want to see it live one day.. This is the beauty of my Pakistan. It is real natural beauty, Pakistan is the home of highest mountains!! @SSA It is absolutely safe. Throughout the trek we met many foreigners, men and women. Some of them had stayed in the base camps for months for summit attempts. There are military posts established throughout the route. No problems with that. By profession I am Banker and Auditor love to travel. By qualification I am proud to be sociologist...... After watching theses amazing pictures, made me to visits up to Concordia K-2 base camp.